Abouts us - Fluo-Tech Industrial Co., Ltd.
Fluoropolymers known as high functional resins have been making great contribution to ndustry. Demand for them has been in creasing steadily and even accelerated by the advancement of high technology. PTFE(polytetrafluoroethlene) ocoupies 60~70% of the total demand for fluoropolymers. Alhough PTFE was discovered more than 50 years ago, because it has a wide service temperature range,high chemical resistance, high insulation, low friction, non-stick, long life, and incombustibility, it never gets outdated and its application is still being expored in new field. Fluo Tech industries Co., Ltd. Is one of the major fabricators of PTFE. 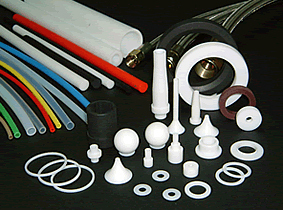 products in Taiwan, which are made of selected fluoropolymers producted by here under international chemical companies such as Du Pont, ICI ,Hoechst, Daikin. thie equipments empioyed, the materials uesed, the specialization of the appointed staff, enable FLUO TECH to assure an excellent standard. Fluo-Tech seted up a new producting line for other fluoropolymer tubings like PFA, FEP to serve our customers.